The financial sector is aware that specific entrepreneurs are under the impression that credit has become scarce and that the financial institutions are imposing stricter demands on those requesting a loan. This impression is also reinforced by the Belgian media. Nevertheless, the figures show that the financial institutions continue to loan in the event of complete and sound credit files. Since 2007, lending in Belgium has grown steadily. 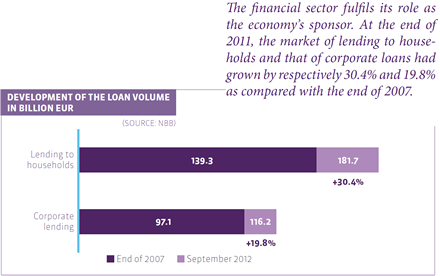 At the end of September 2012, both the market of loans to families and that of corporate loans had grown by 30.4% and 19.8%, respectively, which means that both categories of lending reached a historic high point. In the last few months, the market has stabilised, especially in respect of requests for loans. This has taken place both in lending to private persons and lending to companies and can be ascribed partially to the current economic situation. Moreover, on the mortgage market, the abolishment of the governmental measures in respect of green loans, the announced discontinuation of the tax deductibility of energy saving measures and the implementation of VAT on notary fees have acted as a brake on applications. A study of Eurostat of October 2011 shows that only 5.7% of the loan requests that SMEs submit are rejected compared to, for example, 26.6% of the requests in Ireland, or 22.5% in the Netherlands, our northerly neighbour. In other words, Belgium comes fourth among the best of all countries in Europe. The Bank Lending Survey, a survey of financial institutions about their conditions for acceding to requests for loans shows that their granting conditions did not become stricter between 2009 and the beginning of this year. At present, however, a change is noticeable. In the third quarter of 2012, the requirements became stricter for the second time in a row (Bank Lending Survey of October 2012). We expect that these stricter conditions will also continue in the near future. That would be the result of, amongst other things, an increase in their funding costs, the general economic reality, the prospects for some branches of industry or companies, the prospects for the housing market, the more unfavourable sureties and the pressure on the margins. Not only do the financial institutions grant sufficient loans, they also make sure that they maintain a proper balance between lending and the prevention of an excessive debt burden. Due to this policy, our country is one of the European countries where the debt burden is relatively low. 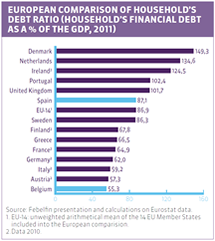 In Belgium, family debt represented 55.3% of the gross domestic product (GDP) in 2011. The European average was 87.1%. That the Belgian consumer does not take out loans without thinking twice is also clear from the loan percentage. According to the National Bank of Belgium (NBB), the ratio between the loan and the value of the real estate (the so-called loan proportion) is about 65%. Mortgage loans of more than 100% of the value of the property are rather rare, which shows that people first use their savings before taking out a loan from their financial institution. In September 2012, the average weighted interest on new bank loans to Belgian companies was 2.98%. This interest therefore once again approaches the earlier historic low of 2.97%, which was reached in July 2012. In Belgium, both private persons and companies may take out a loan at competitive interest rates. Compared to the Netherlands, the interest rates for all available mortgage loans and corporate loans are considerably lower (in some cases nearly 2%). That, despite the decrease in demand and the considerable vigilance, the number of loans that have been granted has continued to increase has much to do with the reshaping of the financial landscape. Since 2007 the financial institutions have phased out their international activities and in this manner strongly reduced the exposure of the Belgian financial sector to international risks. Whereas funding via the financial markets was phased out, funding via Belgian saving accounts was increased. Due to these changes, lending in Belgium could grow continuously. Sound lending is the engine of a well running economy. In that context, the financial sector expresses its concern about the Basel III legislation. One of the things it determines is that the capital requirements that are imposed on the financial institutions will become approximately twice as strict by 2013. This implies that, if they want to issue the same volume of loans, they must double their equities. At present, an immediate problem has not yet been established in Belgium, but in the long run Basel III may have an impact on the availability and price of the long-term loans. The financial sector and the government will have to think of solutions that can guarantee ways of continuously supplying oxygen to the economy. A number of alternative sources of funding for companies and projects on a term of more than seven years, are being studied. The project bond, which the financial institutions have discussed with various government institutions, could offer a solution for long-term funding. Project bonds are liquid investments that are used to fund projects that are known beforehand. That may be the construction of a motorway or of a hospital. The sector is convinced that a public can be found that is prepared to fund sustainable social investments. Both insurers/pension funds and private persons may be interested in such a product: the tranche of 1 to 7 years can be sold to private customers, and the tranche of 7 to 30 years to insurance companies. It offers the investor a possibility to diversify. The realisation of such projects may also contribute to reactivating the economy. Important areas of concern in corporate lending are the speed at which the loan requests are handled and the communication in relation to them. In the past few months it has become clear that the few entrepreneurs whose loan requests are rejected would like to know why. Therefore the financial institutions have undertaken within the Business Financing Platform, a discussion group of financial institutions and companies within Febelfin, to answer a well-documented loan request within fourteen bank office days. Both for private loans and for consumer loans, granting a loan and the associated criteria are very strictly regulated. Those criteria are stated in the “Principles to handle and grant consumer and mortgage loans in a responsible manner”. For corporate lending there is the “Code of conduct between banks and companies in the framework of lending”.